In Britain, the United States has come to represent everything bad when it comes to healthcare and higher education. 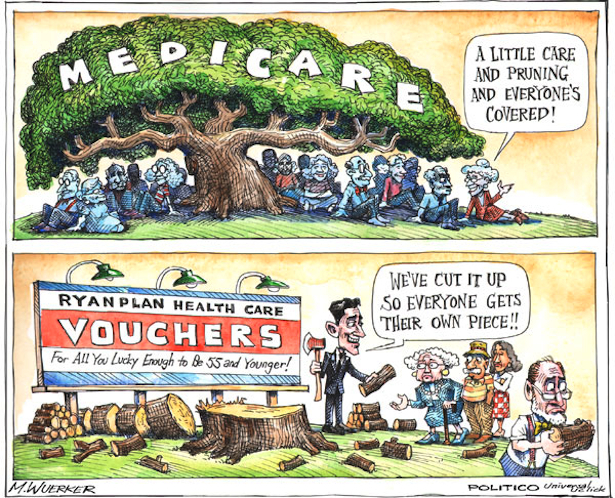 “American-style” is the specter haunting the coalition government’s plan to privatize the National Health System. Ask a Briton to describe “American-style” healthcare, and you’ll hear a catalog of horrors that include grossly expensive and unnecessary medical procedures and a privatized system that favors the rich. For a people accustomed to free healthcare for all, regardless of income, the fact that millions of their cousins across the Atlantic have no insurance and can’t afford decent treatment is a farce as well as a tragedy. . . So frightening is the Yankee example that any British politician who values his job has to explicitly disavow it as a possible outcome. Twice. “We will not be selling off the NHS, we will not be moving towards an insurance scheme, we will not introduce an American-style private system,” Prime Minister David Cameron emphatically told a group of healthcare workers in a nationally televised address last week. In case they didn’t hear it the first time, Cameron repeated the dreaded “A”-word in a list of five guarantees he offered the British people at the end of his speech. “American-style” also haunts the reform of Britain’s system of higher education. To make up for lost state funding, many public universities, including Oxford and Cambridge, have decided to take advantage of a new law allowing them to charge students a maximum of $14,750 in annual tuition, nearly triple the current price tag. Shelling out huge sums for college may be part of the American way, but Britons don’t like it. Last week, well-known philosopher A.C. Grayling caused a stir by announcing the creation of a private university, featuring top British and U.S. academics, that will charge nearly $30,000 a year. That’s what the United States has come to represent: providing quality healthcare and higher education for a select few and forcing everyone else to fend for themselves based on private health insurance, student debt, and for-profit universities. Healthcare and higher education, in the dreaded word, American-style. Here’s a link to Terry Eagleton’s response to Grayling’s private university. Freedom from state intervention for him means freedom to charge students sky high fees. If this catches on, the current crisis in universities will escalate into educational apartheid of the kind that we already have at secondary school level. There will be a number of private unis where students are assigned fags and expect to stroll into the Foreign Office with a third-class degree, and a lot of other places which cannot afford to paint the walls. Just when the real Oxford and Cambridge have been dragging themselves inch by inch into the modern democratic world, an ultra-Oxbridge is being proposed which will probably have an even lower intake of working class students than Cambridge did when I was there in the 1960s. Grayling’s scheme is odious.